Toshiba has just announced that they are rolling out two more lines of LED lighting products in order to bolster their growing selection for the residential and commercial markets. The new series is impressive, and like most quality LEDs out there, the bulbs will bring sizable savings over halogens and incandescent bulbs. The two new lines of lighting are for M16 bulbs and PAR38 sized lamps, and seem to fit in just about any kind of spot lighting design scenario — a real strength of LED technology. They are used to replace the embarrassingly inefficient halogen bulbs with similar light intensity and style of beams (Toshiba was the first manufacturer to stop production of incandescent bulbs). A reduction in heat, a savings of 75% in energy, and a long life make the LED replacement bulbs a major cost saver. 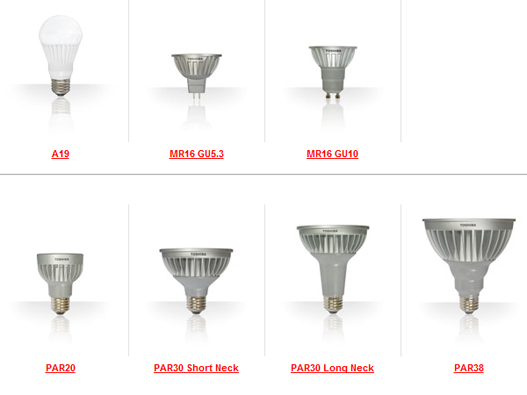 Moreover, Toshiba’s line of 20 different types of PAR38 bulbs should make it easy for interior designers and lighting professionals to get just the right fit. The Toshiba LEDs Color Rendering Index (CRI) is between 80-85, again does not really jump out especially whith CREE and Sylvania coming in upward of CRI 95. Of course, you are paying for quality, and while we haven’t checked the price of the bulbs, we assume they will fall in the middle of the pack. But the real standout for Toshiba is their huge selection of colors, beams, brightness and sizes.